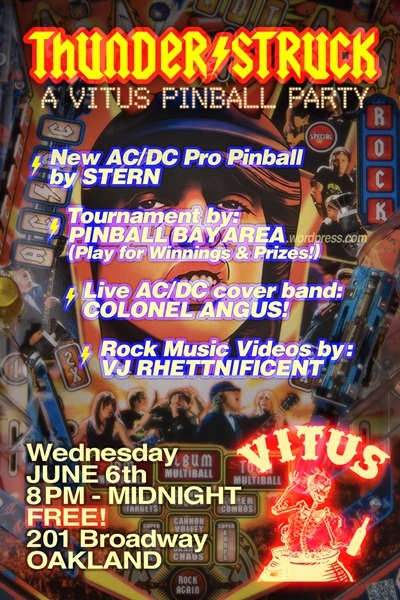 ACDC cover band Colonel Angus and Pinball Bay Area have teamed up for a night of music and pinball. Free entry. Novice Pinball tournament. $5 entry + Quarters for games. All $5 entries paid out to winners. Raffle prizes for all entrants and plaques to winners. Also enjoy playing the six pinballs, including Medieval Madness, Elvira Scared Stiff, Twilight Zone, Getaway, Theater of Magic and ACDC. Format: Play one game of ACDC and one game of Getaway. Your combined rank across the two games will determine if you play in the Finals. Finals will be top 8 overall on ACDC. Who is a Novice? A novice cannot have a World Pinball Player Ranking of 500 or better, and cannot have won a previous tournament at Vitus.